A quest to listen to the entire Big Finish range – in chronological order! For all that she doesn’t die this time around (hopefully not a spoiler! ), this is still a dark and twisted story, even without the Wirrn in the mix. This script is all about relationships, abandonment, and desperate attempts to bring the past back to life. Miscommunication and lack of communication causes problems galore and precipitates an absolute massacre at Nerva City, just as humanity is celebrating a somewhat rehashed version of the Olympiad. You really get the impression that this is humanity on a shoestring, humanity on the verge of extinction – just as it was back in the Ark in Space, but even more so given that Earth’s environment is now so hostile. The Wirrn aren’t predators as such, but they could tip the fragile balance. Indeed, the Nerva City massacre could just be another “audio event” but that it comes on the back of Flip’s desperate survival bid. It could easily have been her. Of the three plays in this trilogy set, this is the stand-out for me. From Iron’s creepy stalking of Flip to the climactic transmat battle, Gallagher’s script keeps the listener on the edge of their seat. 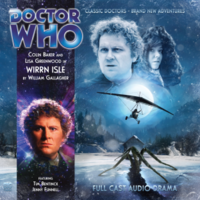 It’s reminiscent of Hinchcliffe-era terror far more than normal Sixth Doctor fare, but that’s a good thing. Ten of Six of the Be… on The Adventure Biggins!